I recently picked up a couple Paul Splittorff rookie cards and immediately thought of doing this with the design. Splittorff’s rookie was the nice black 1971 Topps set. He was on a dual rookie stars card with Jerry Cram. 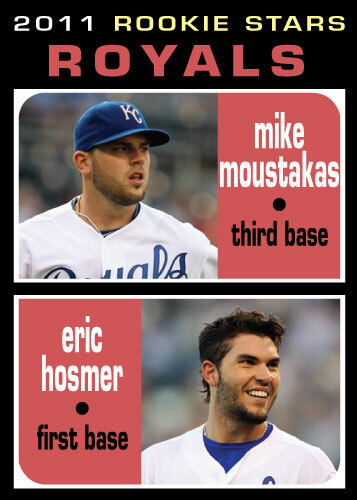 I couldn’t resist the urge to do this card with Mike Moustakas and Eric Hosmer. Right now Hosmer is a lot more of a rookie star than Moustakas but they are both everyday players in the major leagues and are well deserving of this card.